George was introduced to the yet to be named Wholand and immediately fell in love with it. He bought a lot and erected a platform tent dubbed “While Your Up”. A humble beginning for the man who would soon become the Mayor of Wholand and move into the Capital. Wholand was George's greatest masterpiece. He had no idea what he had created, George was just being George. He didn't build Wholand, he cultivated Wholand and what it is to be a Who. 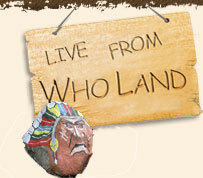 You can't build a place like Wholand, you can only nurture the spirit and energy that is Wholand. More a state of mind than a physical place. George brought that to life for himself and his friends. 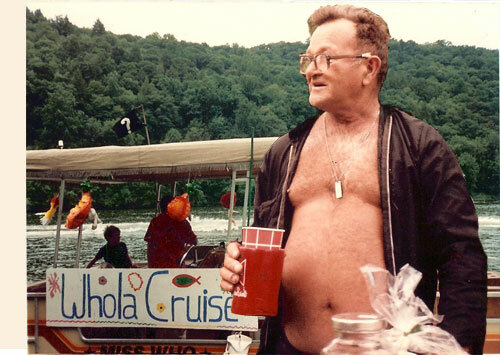 George brought the very first Pontoon boat to Wholand. As pontoon boats go, it was one of the first, before they really came into fashion. It sailed on the lake most days of the week because it was the good Mayor's passion. Officials on board, at the helm was Porky they captain. Just like George, there will never be another like her, the "Miss Who". There is no doubt, without George there would never have been a Wholand. It is in fact, "George's Wholand". Even if he would never claim it.